РќР°Р¶РјРёС‚Рµ СЃСЋРґР° РµСЃР»Рё Р’Р°Рј Р±РѕР»СЊС€Рµ 18-С‚Рё Р»РµС‚. РџСЂРѕСЃРёРј РїРѕРєРёРЅСѓС‚СЊ СЃР°Р№С‚, РµСЃР»Рё РІР°Рј РЅРµС‚ 18 Р»РµС‚. 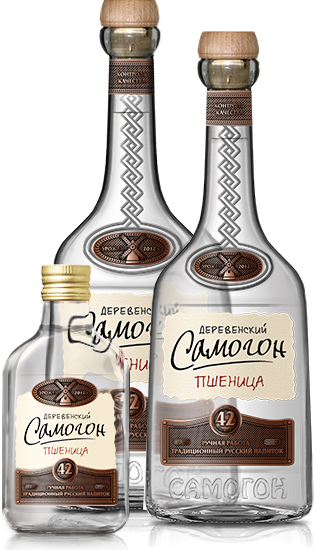 "Derevenski Samogon" is a Traditional Russian Grain Spirit over the past four centuries. Samogon is manufactured by distilling grain mash by hand in the copper pot still. Traditional flavor of Samogon - bread of rye, wheat, malted barley and oats. The taste of "Derevenski Samogon"TM is soft, harmonious, warm without burning. Volume of alcohol is 42%. Samogon is traditionally drunk by 2cl - 4cl shots or in great variety of cocktails. Samogon is great as an aperitif and as a main drink at the table. for persons of legal drinking age.